Production of the Renault AE Magnum, as it was first know, started in 1990 (the same year I started secondary school!) at Renaults Bourg-en-Bresse plant. 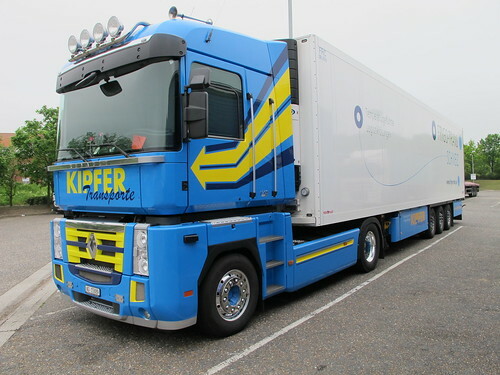 The truck was designed to be for long haul operators and by all accounts it did become a firm favourite with a lot of international operators. I can’t remember his name but there was a German owner driver who used to run right across Russia, an Astran subbie had a red one running to Middle East to name a couple of famous ones. Also Norbert Dentressangle ran them from Spain and with Aston Clinton Haulage. Eddie Stobart had some, I think long haul operator Ralph Davies had one. Countless F1 Grand Prix teams have used them as the flagships for the team and sponsors. All in all they have always been seen as something a bit special. These days you can pick them up for a few thousand pounds, perhaps they could become a collectors item in years to come?? Personally I never had the Magnum experience and didn’t get to drive one (perhaps there is still time) but it seemed to always be a truck that divided drivers. Either you loved it or hated it. Those who weren’t fans often claimed they felt sea sick, due to the cab being one of the first to be fully air suspended by I think 4 air bags. I’m sure you’ve all see a Magnum leaning well to one side when the air bags had gone. I can actually only remember sitting in a Magnum once, which was just a few years ago at the IAA Show in Hanover. I was a bit surprised that the cab didn’t feel a bit bigger, but then I guess if I had got in one back in 1990 it would have felt huge compared to most other cabs on the market then. Saying that I still got the feeling of a big cab, flat floor and a very high seating position, which along with the huge coach like windscreen, made for pretty good forward vision. 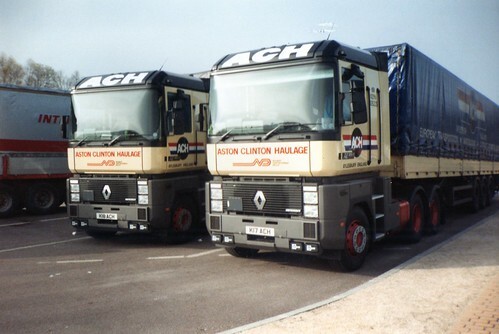 The AE Magnum was voted International Truck of the Year in 1991. 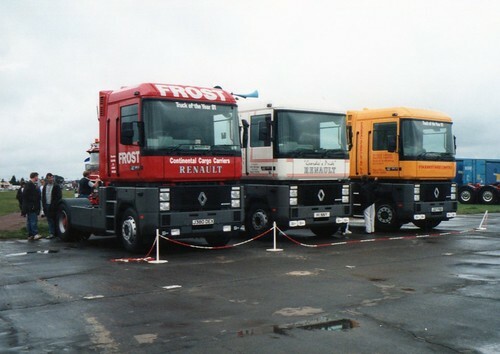 At the time the truck was the first in production from Renault with disc brakes, along with some other mechanic firsts, it was thought that it was the trucks flat floor cab with its 1.87 metres of head room (this was over 2m when production stopped) that gave it the edge to win the ITOTY. 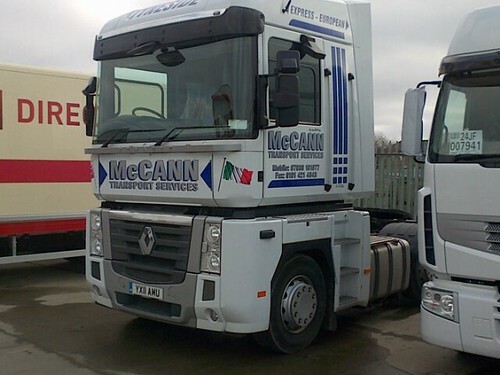 The truck was known as the Renault AE Magnum, Renault wanted the range to be known as the Renault AE. 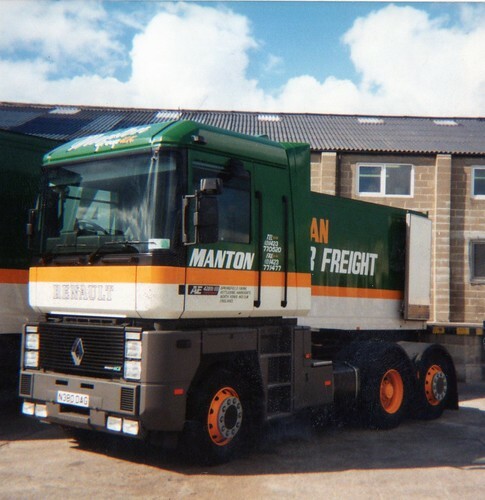 This was the case for the 1st 7 years, then in 1997 it was decided that all trucks in the range would be named some thing beginning with the letter “M”, so from then on it was known as the Renault Magnum. A number of special editions over the years have almost gone by without notice, the Magnum Vega, the Magnum Route 66 to name a couple and the last was the Magnum Legend, which was a limited run of 99 trucks produced to celebrate the 20th anniversary of the truck. Well that’s about all I can tell you about the Magnum, but I think its fair to say that the Magnum may be gone but I don’t think it will ever be forgotten. It was the truck that pioneered the way to big cabs and big living space for the driver. It was an eye catcher no matter whether in a good way or a bad way, it all depends on your own taste. I was a fan and will miss the big Frenchie, it’s a sad fact that the new Renault truck range just doesn’t have any outstanding about it. Good trucks they are yes, but they will no way near fill the legendary shoes left by the Magnum. A truly unique truck. 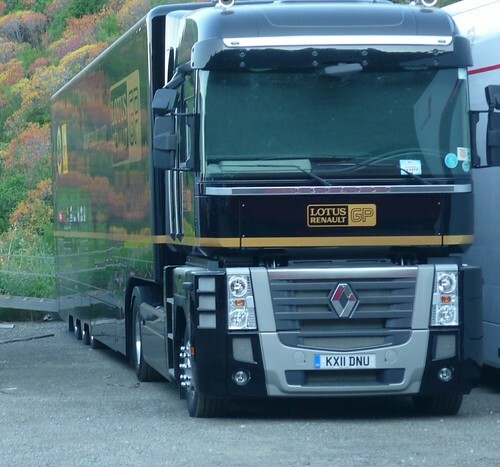 Renault AE Magnum R.I.P. 1990 – 2013. Click this link for all you need to know about the Magnums life: CLICK HERE. 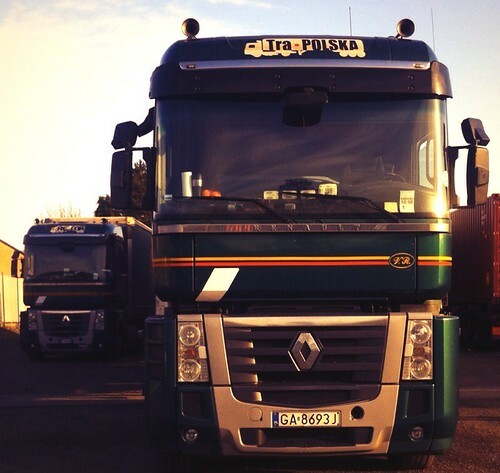 This entry was posted in Golden Oldies, International Mega Trucking, Photos, Renault by truckbloguk. Bookmark the permalink.